Great opportunity for a working ownership team to take over an existing restaurant location with big upside available just by stepping in and operating the place yourself. Located in the Liberty Station Public Market building, this is a turn key restaurant space just waiting for the right owners to take over. Current owners opened this as a satellite location and have found that they simply don’t have the time to dedicate to the operation of this space. Are you looking to get into a restaurant with no down time and a huge price discount compared to building out a space like this new? Here is you chance. 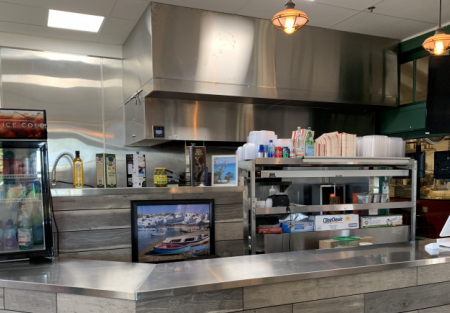 Restaurant has an outstanding location with-in the Liberty Station marketplace and is very easy to operate. It is set up to be run by a two-person ownership or crew. 2018 sales have been approximately $1000/day. Year to date profit statement shows that an owner operator could expect to net 45-50k per year. This is an outstanding opportunity to hit the ground running as an owner operator you will be making money from day one. Currently run by absentee ownership, eliminate managers and employee labor to really see bottom line swell. Rent for the space is a very manageable $3821/month. Rent includes uilities, SDGE, trash and water are all included in monthly rent. Lease term renews yearly. Come by today to see if this is the place you have been searching for.